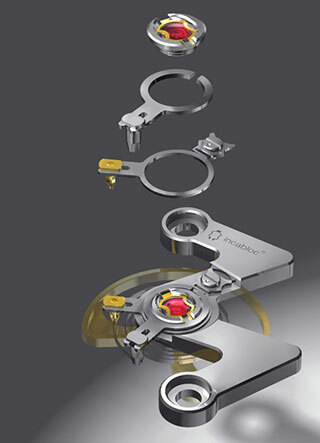 The Incabloc adjustment index with a cam and pawl provides two levels of adjustment. The adjustment index with a cam and pawl is an innovative product developed from a design that combines flexibility and stability. It provides two levels of adjustment. The cam and pawl enable a quick adjustment by turning the whole index. The index can be moved precisely for finer adjustment by turning the cam. The shape of the fine-adjustment device can of course be customised.